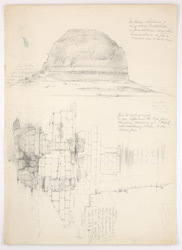 Pencil drawing of the Stupa at Manikiala in the Rawalpindi District of the Punjab in Pakistan, by Frederick Charles Maisey (1825-1892), c. 1845-1852. There are extensive notes written in pencil on the drawing. Maisey, who served with the Bengal Native Infantry and rose to the rank of General, explored antiquities in Uttar Pradesh and Central India from 1845-52. He was Assistant Commissioner in the Punjab from 1854-1856. The remains of the great stupa at Manikiala was excavated by General Court in 1834 and is dated to the Kushana period, 1st-2nd century A.D. It is believed to have once housed body relics of the Buddha. This was an important pilgrimage site and the complex consists of the stupa and several ruined temples.